Large planters are a planter variant that fits nicely in a 1x1 floor/foundation. It can hold a maximum of 9 separate plants, including corn, hemp, and pumpkin. Seeds placed in a planter grow 2x as fast as they would normally on wild ground. Being exposed to light (be it natural sunlight or artificial ceiling lamps) further increases the growth time to 4x the normal speed. Planters also grant you the ability to water the plants, which significantly increases their yield when harvested. A fully matured hemp plant produces 10 cloth normally, but can produce up to 40 cloth when watered properly. To fill your planter with water, simply fill a bucket and dump it straight onto your planter. 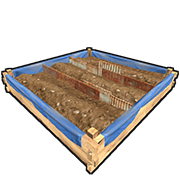 The maximum amount of water a large planter can hold at once is exactly 9000 ml, and once plants are planted they will soak up an initial amount of water, so it will drain the water fast initially. You may need to refill the planter several times if using many plants at the same time.